Description: New Arrival! Recorded in New York in 1990, this is the CD that made Russian pianist Vladimir Shafranov popular overnight, and put the nascent label Atelier Sawano on the map when it was released in Japan in 1999. 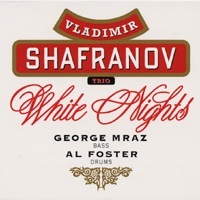 More than ably assisted by veterans George Mraz and Al Foster, Shafranov delves into standards and jazz musician's original compositions with passion and inspriration. Jazz legend Cedar Walton wrote on this album: "Finally, a trio recording that maintains excitement after repeated listenings. Rarely have I experienced this combination of good choice of material, variation of mood, thoughtful formats, plus a spontaneous quality throughout. Bravo!" This album has already achieved a "classic" status among Japanese jazz fans. Piano trio music doesn't get much better than this!